Area: 23,180 sq. km; slightly smaller than Massachusetts. Cities: Capital: Djibouti. Other cities — Dikhil, Arta, Ali-Sabieh, Obock, Tadjourah. Nationality: Noun and adjective — Djiboutian(s). Annual population growth rate (2011 est. ): 2.237%. Ethnic groups: Somali, Afar, Ethiopian, Arab, French, and Italian. Religions: Muslim 94%, Christian 6%. Languages: French and Arabic (official); Somali and Afar widely used. Health: Infant mortality rate: 54.94/1,000. Life expectancy — 61 years. Work force: Low employment rate. The largest employers are the Government of Djibouti, including telecommunications and electricity; Port of Djibouti; and airport. The U.S. Government, including the U.S. military base at Camp Lemonnier, is also a large employer. Able-bodied unemployed population (est. 2007) — 59%. Constitution: Ratified September 1992 by referendum. Branches: Executive: president. Legislative — 65-member parliament, cabinet, prime minister. Judicial — based on French civil law system, traditional practices, and Islamic law. Administrative subdivisions: 6 regions (districts) — Ali-Sabieh, Arta, Dikhil, Djibouti City, Obock, and Tadjourah. Political parties: People's Rally for Progress (RPP); National Democratic Party (PND); Front For The Restoration of Unity and Democracy (FRUD); Djibouti Development Party (PDD); People's Social Democratic Party (PPSD); Republican Alliance for Democracy (ARD); Union for Democracy and Justice (UDJ); Union of Reform Partisans (UPR). National holiday: Independence Day, June 27. GDP (2010 est. ): $1.14 billion. Per capita income (2010 est. ): $2,800. Natural resources: Minerals (salt, perlite, gold, gypsum, limestone) and energy resources (geothermal, wind, and solar). Agriculture (less than 3% of GDP): Products — livestock, fishing, and limited commercial crops, including fruits and vegetables. Industry: Types: banking and insurance (12.5% of GDP), public administration (22% of GDP), construction and public works, manufacturing, commerce, and agriculture. Trade (2006 est. ): Imports: $1.555 billion: consists of basic commodities, including food and beverages, pharmaceutical drugs, transport equipment, chemicals, and petroleum products. Exports — $340 million: re-exports, hides and skins, and coffee (in-transit). Major markets (2004) — France, Ethiopia, Somalia, India, China, and Saudi Arabia and other Arabian peninsula countries. 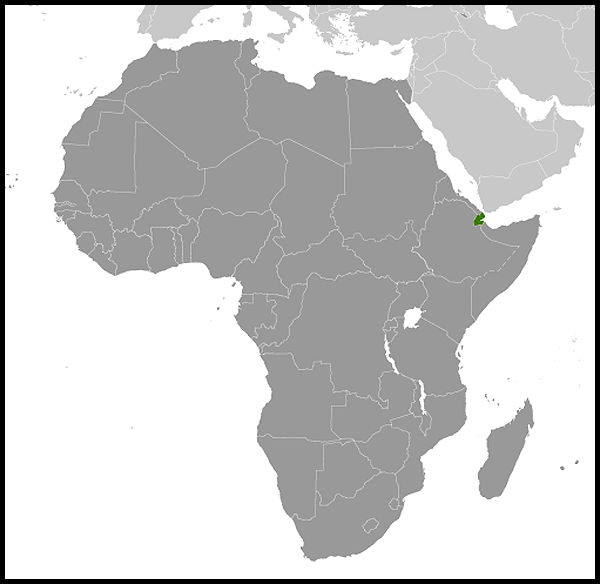 About two-thirds of the Republic of Djibouti's inhabitants live in the capital city. The indigenous population is divided between the majority Somalis (predominantly of the Issa tribe, with minority Issaq and Gadabursi representation) and the Afars (Danakils). All are Cushitic-speaking peoples, and nearly all are Muslim. Among the 15,000 foreigners residing in Djibouti, the French are the most numerous. Among the French are approximately 3,000 troops. The Republic of Djibouti gained its independence on June 27, 1977. It is the successor to French Somaliland (later called the French Territory of the Afars and Issas), which was created in the first half of the 19th century as a result of French interest in the Horn of Africa. However, the history of Djibouti, recorded in poetry and songs of its nomadic peoples, goes back thousands of years to a time when Djiboutians traded hides and skins for the perfumes and spices of ancient Egypt, India, and China. Through close contacts with the Arabian Peninsula for more than 1,000 years, the Somali and Afar tribes in this region became the first on the African continent to adopt Islam. It was Rochet d'Hericourt's exploration into Shoa (1839-42) that marked the beginning of French interest in the African shores of the Red Sea. Further exploration by Henri Lambert, French Consular Agent at Aden, and Captain Fleuriot de Langle led to a treaty of friendship and assistance between France and the sultans of Raheita, Tadjourah, and Gobaad, from whom the French purchased the anchorage of Obock (1862). Growing French interest in the area took place against a backdrop of British activity in Egypt and the opening of the Suez Canal in 1869. In 1884-85, France expanded its protectorate to include the shores of the Gulf of Tadjourah and Somaliland. Boundaries of the protectorate, marked out in 1897 by France and Emperor Menelik II of Ethiopia, were affirmed further by agreements with Ethiopian Emperor Haile Selassie I in 1945 and 1954. The administrative capital was moved from Obock to Djibouti in 1892. In 1896, Djibouti was named French Somaliland. Djibouti, which has a good natural harbor and ready access to the Ethiopian highlands, attracted trade caravans crossing East Africa as well as Somali settlers from the south. The Franco-Ethiopian railway, linking Djibouti to the heart of Ethiopia, was begun in 1897 and reached Addis Ababa in June 1917, further facilitating the increase of trade. During the Italian invasion and occupation of Ethiopia in the 1930s and during World War II, constant border skirmishes occurred between French and Italian forces. The area was ruled by the Vichy (French) government from the fall of France until December 1942, and fell under British blockade during that period. 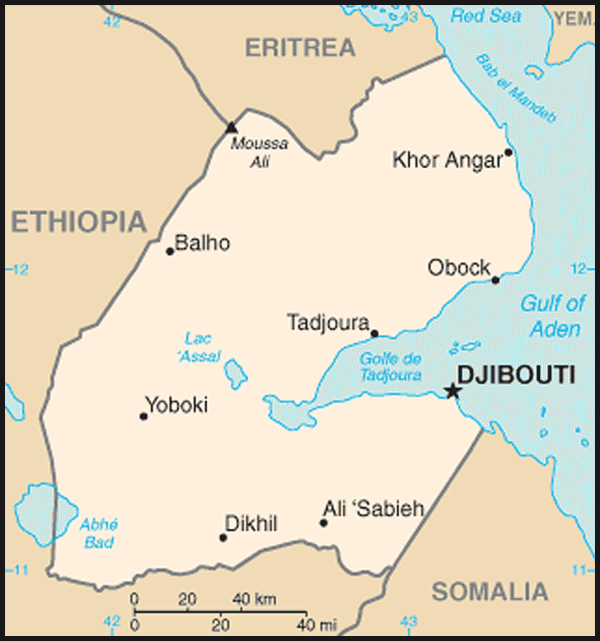 Free French and the Allied forces recaptured Djibouti at the end of 1942. A local battalion from Djibouti participated in the liberation of France in 1944. On July 22, 1957, the colony was reorganized to give the people considerable self-government. On the same day, a decree applying the Overseas Reform Act (Loi Cadre) of June 23, 1956, established a territorial assembly that elected eight of its members to an executive council. Members of the executive council were responsible for one or more of the territorial services and carried the title of minister. The council advised the French-appointed governor general. In a September 1958 constitutional referendum, French Somaliland opted to join the French community as an overseas territory. This act entitled the region to representation by one deputy and one senator in the French Parliament, and one counselor in the French Union Assembly. The first elections to the territorial assembly were held on November 23, 1958, under a system of proportional representation. In the next assembly elections (1963), a new electoral law was enacted. Representation was abolished in exchange for a system of straight plurality vote based on lists submitted by political parties in seven designated districts. Ali Aref Bourhan, allegedly of Turkish origin, was selected to be the president of the executive council. French President Charles de Gaulle's August 1966 visit to Djibouti was marked by 2 days of public demonstrations by Somalis demanding independence. On September 21, 1966, Louis Saget, appointed governor general of the territory after the demonstrations, announced the French Government's decision to hold a referendum to determine whether the people would remain within the French Republic or become independent. In March 1967, 60% chose to continue the territory's association with France. In July of that year, a directive from Paris formally changed the name of the region to the French Territory of Afars and Issas. The directive also reorganized the governmental structure of the territory, making the senior French representative (formerly the governor general) a high commissioner. In addition, the executive council was redesignated as the council of government, with nine members. In 1975, the French Government began to accommodate increasingly insistent demands for independence. In June 1976, the territory's citizenship law, which favored the Afar minority, was revised to reflect more closely the weight of the Issa Somali. The electorate voted for independence in a May 1977 referendum. The Republic of Djibouti was established on June 27, 1977, and Hassan Gouled Aptidon became the country's first president. In 1981, he was again elected president of Djibouti. He was re-elected, unopposed, to a second 6-year term in April 1987 and to a third 6-year term in May 1993 multiparty elections. In early 1992, the constitution permitted the legalization of four political parties for a period of 10 years, after which a complete multiparty system would be installed. By the time of the December 1992 national assembly elections, only three had qualified. They were the Rassemblement Populaire Pour le Progres (People's Rally for Progress — RPP), which was the only legal party from 1981 until 1992; the Parti du Renouveau Democratique (The Party for Democratic Renewal — PRD); and the Parti National Democratique (National Democratic Party — PND). Only the RPP and the PRD contested the national assembly elections, and the PND withdrew, claiming that there were too many unanswered questions on the conduct of the elections and too many opportunities for government fraud. The RPP won all 65 seats in the national assembly, with a turnout of less than 50% of the electorate. In early November 1991, civil war erupted in Djibouti between the government and a predominantly Afar rebel group, the Front for the Restoration of Unity and Democracy (FRUD). The FRUD signed a peace accord with the government in December 1994, ending the conflict. Two FRUD members were made cabinet members, and in the presidential elections of 1999 the FRUD campaigned in support of the RPP. In 1999, Ismail Omar Guelleh — President Hassan Gouled Aptidon's chief of staff, head of security, and key adviser for over 20 years — was elected to the presidency as the RPP candidate. He received 74% of the vote, with the other 26% going to opposition candidate Moussa Ahmed Idriss of the Unified Djiboutian Opposition (ODU). For the first time since independence, no group boycotted the election. Moussa Ahmed Idriss and the ODU later challenged the results based on election "irregularities" and the assertion that "foreigners" had voted in various districts of the capital; however, international and locally based observers considered the election to be generally fair, and cited only minor technical difficulties. Guelleh took the oath of office as the second President of the Republic of Djibouti on May 8, 1999, with the support of an alliance between the RPP and the government-recognized section of the Afar-led FRUD. In February 2000, another branch of FRUD signed a peace accord with the government. On May 12, 2001, President Guelleh presided over the signing of what was termed the final peace accord officially ending the decade-long civil war between the government and the armed faction of the FRUD. The peace accord successfully completed the peace process begun on February 7, 2000 in Paris. Ahmed Dini Ahmed represented the FRUD. Djibouti is a republic whose electorate approved the current constitution in September 1992. Many laws and decrees from before independence remain in effect. In April 2011, President Ismail Omar Guelleh was re-elected for a third term. In April 2005, Guelleh had been re-elected at the head of a five-party coalition that included the FRUD and other parties. A loose coalition of opposition parties boycotted the 2005 election. Currently, political power is shared by a Somali Issa president and an Afar prime minister, with an Afar career diplomat as Foreign Minister and other cabinet posts roughly divided. However, some Djiboutians feel that Somali Issas are likely overrepresented in the government, civil service, and ruling party. That, together with a shortage of non-government employment, has bred resentment and continued political competition between the Somali Issas and the Afars. In March 2006, Djibouti held its first regional elections and began implementing a decentralization plan. Parliamentary elections were held in February 2008. The broad pro-government coalition, including FRUD candidates, again ran unopposed when the government refused to meet opposition preconditions for participation. Djibouti has its own armed forces, including a small army, which grew significantly with the start of the civil war in 1991. With the 2001 final peace accord between the government and the Afar-dominated FRUD, the armed forces have been downsized. The country's security is supplemented by a formal security accord with the Government of France, which guarantees Djibouti's territorial integrity against foreign incursions. France maintains one of its largest military bases outside France in Djibouti. There are some 3,000 French troops stationed in Djibouti, including units of the famed French Foreign Legion. The right to own property is respected in Djibouti. The government has reorganized the labor unions. While there have been open elections of union leaders in the past, some labor leaders allege interference in their internal elections. Others voice opposition to newly-implemented labor laws that apply to new jobs created in free zones and that are less favorable to labor. In 2002, following a broad national debate, Djibouti enacted a new "Family Law" enhancing the protection of women and children, unifying legal treatment of all women, and replacing Sharia. The government established a minister for women's affairs and is engaged in an ongoing effort to increase public recognition of women's rights and to ensure enforcement. The government is leading efforts to stop illegal and abusive traditional practices, including female genital mutilation. As the result of an ongoing effort, the percentage of girls attending primary school increased significantly and is now more than 50%. However, women's rights and family planning continue to face difficult challenges, many stemming from acute poverty in both rural and urban areas. With female ministers and members of parliament, the presence of women in government has increased. Despite the gains, education of girls still lags behind boys, and employment opportunities are better for male applicants. Djibouti's mission to the UN is located at 866 UN Plaza, Suite 4011, New York, NY 10017 (tel. 212-753-3163). Djibouti's embassy in Washington is located at Suite 515, 1156 15th Street, NW, Washington, DC 20005 (tel. 202-331-0270; fax 202-331-0302). Djibouti's economy depends largely on its proximity to the large Ethiopian market and a large foreign expatriate community. Its main economic activities are the Port of Djibouti, the banking sector, the airport, and the operation of the Addis Ababa-Djibouti railroad. During the "lost decade" following the brunt of its civil war (1991-94), there was a significant diversion of government budgetary resources from developmental and social services to military needs. However, from 2001 on, Djibouti has become a magnet for private sector capital investment, attracting foreign direct investment inflows that now top $200 million annually. It has also significantly improved its finances, paying current salaries, maintaining reserves, and generating a growth rate in 2008 of approximately 5.8%. Djibouti has become a significant regional banking hub, with approximately $600 million in dollar deposits. 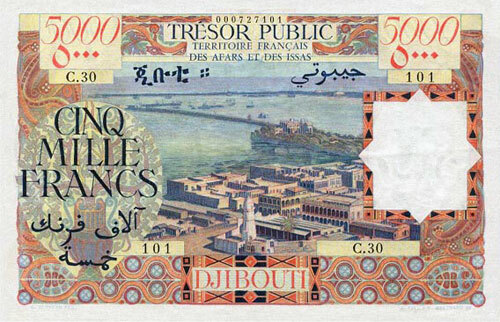 Its currency, the Djiboutian franc, was linked to the dollar (and to gold) in 1949 and appreciated twice over the interim when the dollar was devalued and then freed to float. Agriculture and industry are little developed, in part due to the harsh climate, high production costs, unskilled labor, and limited natural resources. Mineral deposits exist in the country, but with the exception of an extraordinary salt deposit at Lac Assal, the lowest point in Africa, they have not been exploited. The arid soil is unproductive — 89% is desert wasteland, 10% is pasture, and 1% is forested. Deforestation for charcoal is a significant problem, as it now replaces expensive imported cooking gas in many urban homes. Services and commerce provide most of the gross domestic product. Djibouti's most important economic asset is its strategic location on the busy shipping route between the Mediterranean Sea and the Indian Ocean. Roughly 60% of all commercial ships in the world use its waters from the Red Sea through the Bab-el-Mandeb strait and into the Gulf of Aden and the Indian Ocean. Its port is an increasingly important transshipment point for containers as well as a destination port for Ethiopian trade. In 2009, Djibouti and Dubai Ports World inaugurated the state-of-the-art, $300 million Doraleh Container Terminal. The older portion of the port will continue serving as a general shipping, bulk cargo, and break-bulk facility and also as the host of a small French naval facility. Business soared at the Port of Djibouti when hostilities between Eritrea and Ethiopia denied Ethiopia access to the Eritrean Port of Assab. Djibouti became the only significant port for landlocked Ethiopia, handling all its imports and exports, including huge shipments of U.S. food aid in 2000 during the drought and famine. In 2000, Dubai Ports World took over management of Djibouti's port and later its customs and airport operations. The result has been a significant increase in investment, efficiency, activity, and port revenues. The Addis Ababa-Djibouti railroad is the only line serving central and southeastern Ethiopia. The single-track railway needs upgrades, but remains an important source of employment. A weekly train from Ethiopia brings in most of Djibouti's fresh fruits and vegetables. The bulk of Ethiopia-bound imports from Djibouti's port are transported via truck. Principal exports from the region transiting Djibouti are coffee, salt, live animals, hides, dried beans, cereals, other agricultural products, and wax. Djibouti itself has few exports, and the majority of its imports come from France. Most imports are consumed in Djibouti, and the remainder go to Ethiopia and northwestern Somalia. Djibouti's unfavorable balance of trade is offset partially by invisible earnings such as transit taxes and harbor dues. In 2007, U.S. exports to Djibouti totaled $59 million, while U.S. imports from Djibouti were about $4 million. The city of Djibouti has the only paved airport in the republic. Djibouti has one of the most liberal economic regimes in Africa, with almost unrestricted banking and commerce sectors. Military and economic agreements with France provide continued security and economic assistance. Djibouti serves as the headquarters for the European Union's "Atalanta" naval task force and for a Japanese contingent, combating piracy off the coast of Somalia. Djibouti is a member of the League of Arab States (LAS) and the Organization of Islamic Cooperation (OIC), as well as the African Union (AU), the Intergovernmental Authority on Development (IGAD), the Common Market for Eastern and Southern Africa (COMESA), and the International Organization of Francophones ("Organisation international de la Francophonie," or OIF). Djibouti is also a member of the East African Standby Brigade Coordination Mechanism (EASBRICOM), which is currently commanded by a Djiboutian general. Djibouti is greatly affected by events in Somalia and Ethiopia, so relations are important and, at times, delicate. The 1991 falls of the Siad Barre and Mengistu governments in Somalia and Ethiopia, respectively, caused Djibouti to face national security threats due to instability in the neighboring states and a massive influx of refugees estimated at 100,000 from Somalia and Ethiopia. In 2000, after 3 years of insufficient rain, 50,000 drought victims entered Djibouti. The number of refugees in Djibouti doubled from 2006 to late 2009, with approximately 12,000 registered with the UN High Commissioner for Refugees (UNHCR), predominantly from Somalia and Ethiopia. As of fall 2011, UNHCR reported 18,000 registered Somali refugees in Djibouti. In 1996, a revitalized organization of seven East African states, IGAD, established its secretariat in Djibouti. IGAD's mandate is for regional cooperation and economic integration, and it has also sought to play a positive role promoting regional stability, including its efforts in support of Somalia's Transitional Federal Government (TFG). Djibouti seeks to play a stabilizing role in the frequently tense regional politics of the Horn of Africa. Djibouti hosted UN-sponsored Somali reconciliation talks in 2008-2009 (the "Djibouti Process"), and provided military training for TFG troops in late 2009. Djibouti became Ethiopia's sole link to the sea when fighting broke out between Ethiopia and Eritrea in 1998. Djibouti's relations with Eritrea have become strained after a military confrontation in June 2008 along their shared border. Djibouti continues to cultivate cordial relations with Ethiopia, reflecting the fundamental economic ties between the two countries and a long tradition of interchanges. However, rising tensions in Somalia and Ethiopian military involvement in Somalia in 2007 fueled widespread criticism of Ethiopia among Djibouti's majority Somali-speaking population. President Guelleh attended the 2007 Africa Union summit in Ethiopia and supports the African Union peacekeeping operation for Somalia (AMISOM). In April 1977, the United States established a Consulate General in Djibouti and upon independence in June 1977 raised the status of its mission to an embassy. The first U.S. Ambassador to the Republic of Djibouti arrived in October 1980. Over the past decade, the United States has been a principal provider of humanitarian assistance for famine relief, and has sponsored health care, education, good governance, and security assistance programs. Djibouti is a U.S. partner on security, regional stability, and humanitarian efforts in the Horn of Africa. The Djiboutian Government has been very supportive of U.S. and Western interests, particularly since the Gulf crisis of 1990-91 and after the terrorist attacks of September 11, 2001. President Guelleh continues to take a very proactive position against terrorism. In 2002, Djibouti agreed to host a U.S. military presence at Camp Lemonnier, a former French Foreign Legion base outside the capital that now houses approximately 2,200 American personnel. U.S. service members have been instrumental in providing humanitarian, development, and security assistance to the people and governments of the Horn of Africa and Yemen. Djibouti has also allowed the U.S. military, as well as other nations, access to its port and airport facilities. The U.S. Agency for International Development's (USAID) Food for Peace program maintains a warehouse for pre-positioned emergency food relief in Djibouti — the only one of its kind outside the continental United States — allowing expedient delivery of humanitarian assistance to famine-stricken countries from Africa to Asia. International Broadcasting Bureau (IBB) facilities in Djibouti transmit Arabic-language Radio Sawa programming and Voice of America (VOA) Somali Service broadcasts to neighboring Somalia and the Arabian Peninsula. The U.S. Embassy (http://djibouti.usembassy.gov/) in Djibouti is at B.P. 185, Lot number 350-B, Lotissement Haramous (tel: (+253) 21-45-30-00, fax: (+253) 21-45-30-20).